One of the best gaming keyboards is on sale at Amazon. You can save a whole lot of money on the Corsair K95 Platinum from Amazon right now; it’s $139.99, a price drop of 30%. We think this is one of the best gaming keyboards at the moment, so anything taken off its normal cost of $199 is much appreciated. It’s going for less in the UK as well. Although Amazon UK doesn’t offer as big a saving, you can still buy it for £149.99 (slashing the original price by £35). 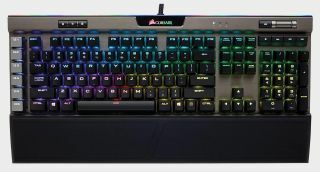 We’re big fans of the K95 Platinum; as we mentioned before, “when you want to go the extra mile and upgrade to the absolute best of the best, it’s hard to find another option other than the Corsair K95 Platinum… feature-wise, the K95 Platinum’s got it all. Dedicated media controls and a USB pass-through, a metal volume wheel, RGB lighting. It even comes with an extra set of textured keycaps for the WASD keys.” As a result, this is a great choice of keyboard if you’re looking to give your gaming setup a makeover in 2019.